Forming hard candies requires careful handling of syrups in order to avoid quality issues like cracking and hazing. A high-specification dedicated hard candy depositing solution ensures first class product quality, whilst incorporating features that reduce running costs due to low scrap rates and rapid changeover and cleaning operations. 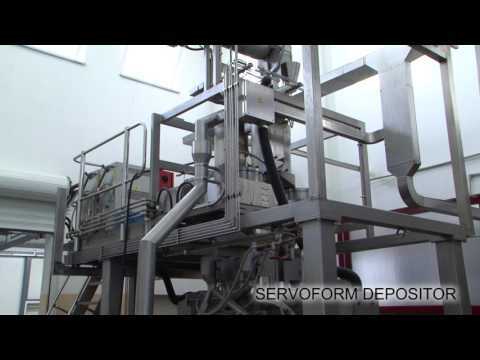 The Baker Perkins ServoForm Hard Candy Depositor has been designed to provide the highest levels of quality in a continuous production environment. These very efficient one-shot depositors can be specified for a wide variety of product types, from simple single-colour solid candies through to striped or layered and even centre-filled products. Up to four colours or components are possible, making ServoForm particularly attractive for manufacturers seeking production flexibility. ServoForm is engineered to maximise product quality, including smoother mouthfeel and improved flavour release. This is achieved by continuously depositing syrup at final moisture directly into solid moulds. This creates candies that do not crack and are crystal clear, with smooth surfaces, and devoid of air bubble and sharp edges. The candies also taste better through enhanced flavour release and a smoother mouth-feel. ServoForm contributes to improved efficiencies and lower costs because its focus on quality leads to very low scrappage rates. The high levels of consistency in candy size and weight mean more efficient wrapping downstream, and the fully automated system requires minimal operator input. Enhanced hygiene and cleaning design includes a fully automatic washout process, with no human intervention required, and easy all-round access. Downtime is minimised thanks to reliable servo drives and quick changeover procedures.